It's a whole lot of fruity fun in one Frappuccino®. 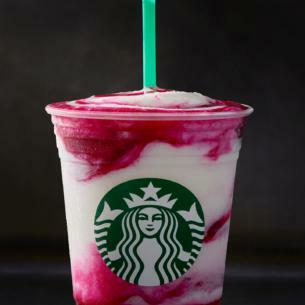 Mango syrup is blended with Frappuccino® Blended Crème base, milk and ice, then poured over a purée of berries and prickly pear, and topped with more purée. ICE, MILK, CRÈME FRAPPUCCINO SYRUP [WATER, SUGAR, SALT, NATURAL AND ARTIFICIAL FLAVOR, XANTHAN GUM, POTASSIUM SORBATE, CITRIC ACID], STRAWBERRY PRICKLY PEAR SAUCE [WATER, WHITE GRAPE JUICE CONCENTRATE, PRICKLY PEAR PUREE, LIME JUICE CONCENTRATE, STRAWBERRY PUREE CONCENTRATE, FRUIT AND VEGETABLE JUICE FOR COLOUR (SWEET POTATO, APPLE, RADISH, CHERRY), XANTHAN GUM, NATURAL FLAVORS, CITRIC ACID], MANGO SYRUP [SUGAR, WATER, MANGO JUICE CONCENTRATE, NATURAL FLAVOR, PASSION FRUIT JUICE CONCENTRATE, CITRIC ACID, POTASSIUM SORBATE, TURMERIC, GUM ARABIC].